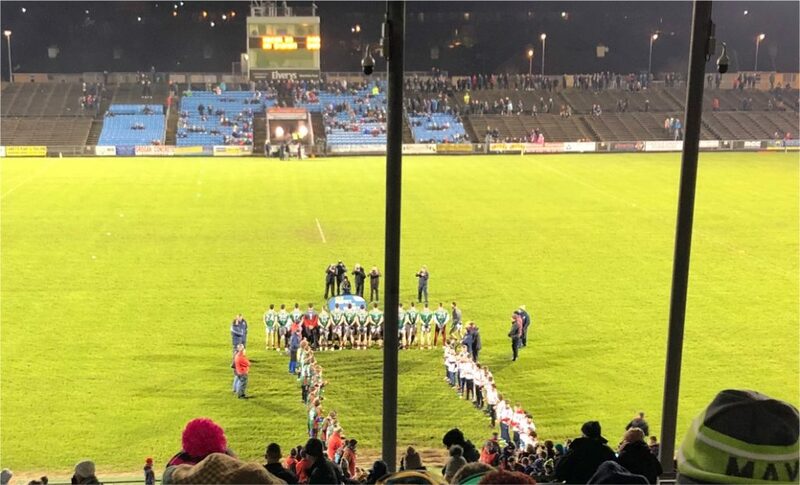 We’ve a small bit of breathing space at the minute, with our NFL Division One Round 4 match against Dublin not taking place until Saturday week. I’m doing a more considered piece on where I think we’re at after the first three rounds of the League – that’ll be online tomorrow – but first it’s worth having a quick run-through on where we stand in relation to playing personnel. Over the first three League matches we’ve used a total of 27 players. Of these, a hard-score of six – Keith Higgins, Lee Keegan, Paddy Durcan, Diarmuid O’Connor, Aidan O’Shea and Jason Doherty – have started in all three matches. Six more – Donal Vaughan, Brian Reape, Andy Moran, Stephen Coen, Fionn McDonagh and James McCormack – have seen action in all three games. Seven lads – Brian Reape, Fionn McDonagh, Conor Diskin, Ciaran Treacy, Michael Plunkett, Matthew Ruane and Colm Moran – have all been handed full League debuts so far this spring. James McCormack, another newbie, has made three appearances off the bench. Players from last year who have yet to feature in the League in 2019 include Seamus O’Shea and Conor Loftus (who both got runs out in the FBD) as well as Chris Barrett. Interestingly, all three were added to the match-day 26 just prior to throw-in on Saturday night, replacing David Drake, Fergal Boland and Darren Coen. Other players who featured for us in the pre-season FBD games but have yet to see any action in the League this year are Caolan Crowe, James Kelly, Ben Doyle, Oisin McLaughlin and Conor O’Shea. Others are still recovering from injuries and medical procedures, with Cillian O’Connor, Cian Hanley, James Durcan and long-term absentee Tom Parsons all falling into this category. Last year’s U20 captain, Ryan O’Donoghue, who has yet to feature for us at senior inter-county level, is also recuperating from surgery at the moment. One area where we’ve been lucky this year – so far at least – is on the injury front. Some years it goes like this: in 2017, for example, we were blessed with an injury-free run right through the Championship whereas last year we suffered one injury blow after another. We lost Evan Regan – a player who has had no luck whatsoever with injuries over the last number of years – late on the last night. The Mayo News yesterday (paper and digital variants) quotes James speculating after the game that Evan’s AC joint “could have gone.” (Primer on AC injuries here). If so, it’s very likely that, sadly, his League campaign is now over. Aside from Evan, though, and those other players on the road to recovery, we’ve a full squad as we head into the next few League matches. It’s just as well, as these are all set to be tough tests for James Horan’s rejuvenated Mayo team. You would never forget that Cillian wasn’t playing in last few games.He will be a great addition when he is back.Surely Parsons not ready yet? You’d have to say that the panel is looking much stronger than this time last year overall. A lot of the new players have made their mark in the league so far. And therell be a lot of contenders for starting places come championship time. Thats where Mayo have been lacking in the last few seasons. Strength in depth on the panel like Dublin. We should have a very strong subs bench this year to come on and see out games. It just looked a total wreck. I don’t know Tom Parsons at all. Shook his hand after games a few times but when he does tog out again for Mayo I would see that as a simply incomparable achievement on so many levels. Medals are one way to measure success, ability and character. Scars tell us a lot too. Goodman Tom, long may you run! Scars tell us a lot more than medals about character, whatever about ability or success. Many have won medals on the coat tails of far better players but are forgotten about by all except those cloest to them. Then you have innumerable players who have won little or nothing but have the fame of greatness attached irrevocably to their names. James is developing the panel nicely. He will have seen as we all have the lack of depth to close out games. To that end i don’t want to see Andy start another league match, if we’re to do any good this year Andy needs to be on the pitch for the last 20 minutes of games. I would start Reape and Doherty inside against the dubs with Mcloughlin drifting out from the other corner. McDonagh, Aidan and Boland half forwards. If boland was deemed good enough to start the league he deserves a chance in better weather! I hope he gives Stephen C and Paddy D a rest for the Dublin game. They have Sigerson semi finals this weekend and final (??). There are plenty more in the panel who need games. These two lads have enough football played for now. Do we want them to pick up muscle injuries that will put then out of action for a period of time? 6 point’s from a possible 6, . 27 player’s used so far. ..A number of young Player’s given their debut, and some impressive performances by those Player’s…., Cillian, Chris Barrett, SOS, hopefully Tom Parsons at some stage… Ryan O Donaghue, James Durcan, Pearce Hanley and more yet to get their chances… It may only be February, but we couldn’t possibly ask for more at this stage of the year… Only one negative is the unfortunate injury to Evan Regan, and best wishes to Evan for a quick recovery…. Report Card so far is an A+. I’m in the process of making arrangements to Kerry for paddys weekend. I’m just wondering what people are doing? Staying in trailer? Down for the weekend? Interesting article in today’s Indo about Mayo’s fundraising plans in New York which seem to be several steps up on previous efforts. No mention of biscuit tins, USA Assorted or otherwise. Sorry I don’t have the IT skills to put up a link. It’s a savage list of players alright with huge competition for places.. who will win or loose out on these coveted places will be very interesting indeed. And this is the way it should be.. this is very reason the panel was opened up and trials held to give everyone there chance. Things can’t have gone much better either in that winning games allows Horan the freedom of experimentation. On saying that he is building around a core group of players so I wouldn’t expect to see too much change for Dublin or any of the remaining games for that matter. One player per game as they come back to fitness maybe.. aside from what we have seen so far that is. I agree that JH return has been impressive in terms of reaction of players, system of play and of course results. However a little reality check is always helpful which you are going to provide tomorrow WJ I think. Victories over Roscommon and Cavan were alwaslikely and essential under any management. Victory over Tyrone in the context of their AL hangover and lack of fitness also not a great barometer. So 6 pts out of 6 may not be as impressive as it seems. The remaining 4 games are much harder and will tell us a lot more. The discovery and blooding of new forwards is very welcome and essential but we don’t know if they are of championship match winning standard yet. Midfield is biggest concern we lack a big ball winner who csn dominate games. Defence very good players but a tactical issue in that the full back line is left isolated to often with too much space in front of it regardless of who is playing FB. Goal keeper without midfield dominace kick outs are key. Overall very much on right track with league final and AL semi-final appearances very possible…. After watching the Cavan game back, Ruane was very good on the ball. He has a good turn of pace too. I’d start Andy in this one aswell. He makes other forwards play well with his movement which will only help McDonagh and Reape, who are still rookies at this level. I agree the next four games will tell us a lot but we already know a fair bit. We know that James Horan and the older guys believe they can win the All Ireland. You can see it in the way they are starting to play for example Keith Higgins. They also believe the younger lads have something serious to contribute. 100% agree with Wide Ball. One question in general, I understood that Jason Gibbons was in the panel. He had a great run of form last year and would make a valuable member of the squad. Horan has two options now, either allow a relative amount of rest for the old dogs and blood the pups for the championship as ye will need them to get over the line in August or September or fight for a national trophy in six weeks time. These young guns could fail on the big stage if they don’t get the required exposure in the big games, Dublin well learn nothing from the young lads of mayo Saturday week but the green and red youngsrers will learn an immeasurable experience from playing the Dubs in Croke Park Saturday week, nothing beats that in my book. Did Adam Gallagher go for trials this year? Thought he done ok in the league games last year..
After last Saturday nights game the aforementioned Jason Gibbons made his way out of McHale Park a few steps ahead of me in the crowd. . In his civvies too so I’m guessing he’s not currently actively part of the group. Red Card this Willie Joe if I’m out of bounds. I’m really looking forward to the game in Croker on Saturday week and if any of you are around I ‘ll be in Tom Mayes on Dorset Street as usual before the game and it would be great to see you for the craic. While it is good to see fresh faces in Feb, I am not sure what impact they will be able to make in Championship. Before we pick our team to contest the AI semi or the like its useful to remember that Super 8’s and AI finals will happen at the other end of the season. Be aware of posters who sing their praises in Feb only to put the boot in the first chance they get in.March I see great potential in some of the newer players and there are a few more to add to that list. But I do not see them make an impact in 2019. This will be a potentially pivotal year for the likes of Crowe EOD, Boland, Drake Coen, Regan, Ruane, J Durcan and Hanley. A couple of these guys have real potential and 2019 could yet be their year. Is Ryan o donaghue still on panel? Also cathal Horan is he been given any game time yet? Last I heard he was at AFL trials. Good one jr. It would be Meath! We will have to start SOS in midfield against the Dublin DOC and M Ruane are great ball players of similar traits but neither are what I would call out and out ball winners give DOC the start and bring in Ruane. While it’s brilliant to see how many newbies we have given game time I would like to see Cathal Horan and Oisin Mc Loughlin get some action before the league ends .I thought it was strange to see 3 changes to the 26 match panel from the program to the actual 26 that were togged I think Boland is entitled to more time after the half he played against the Rossies in the storm the first day. I fully agree Gamechanger 10 and hope that the team selection gives youth their chance to learn, from goalkeeper to midfield and forwards especially. It will be a match Dublin will gunning to win and Mayo’s new combinations are needed to challenge afresh. Would think Seamie O Shea is still getting up to speed on his fitness .. Maybe good for second half v Dubs .. Pure honest , hearty player but a little bit predictable when he gets the ball but I’m sure JH is looking at all the finer details . Club semi finals should be interesting on Sat . I don’t think wide ball will be far out with starting 15. Horan will not want to give too much away re our progress on rebuilding a team. We will learn a lot about McDonagh Reape and Plunket. Also our strength in depth. Acid test for where we are at. A Dub supporter told me that Jim Gavin had requested that Sam be taken out of circulation in December. He didnt want it in permanent circulation all year round around the county in a move to whet the Dubs appetite to win it back for a record 5th consecutive time. Don’t think the Dubs have too much to learn about themselves. Even after they play us, regardless how that game goes they won’t have much pressure with 3 league games remaining against Roscommon Cavan and Tyrone no disrespect to these 3 counties. It would be massive for us though if we can leave a calling card next week. A good solid display especially with the new lads would be hugely encouraging for us. We don’t have to win but if we can put it up to them next week with our new look team and with months of building the team before the real summer shenanigans kick off, well it would be nice to give them something else to think about. Show them we haven’t gone away. I hope the real hype overhype for the Dubs drive for 5 kicks off soon. The more headlines there is about It the better. No doubt they’ll be gunning to skin us next week to lay down their marker. They know where the danger lies. Even had Connolly out against us last year in the league in his last appearance in a Dublin jersey. We have nothing to lose next week but we can learn an awful lot. Good question…where is Cathal Horan. Showed promise in Croke Park. Hope he doesn’t bother with that afl shite. Play for the glory of your county and savour the honour of representing your people. Take inspiration from other GAA icons like ciaran Kilkenny and Sean Cavanagh who turned down approaches from the afl to fulfil their dream of winning an All Ireland for their county rather than those who left for the money. Christ Mayonaze. If a young lad wants to go and make a bloody good living for himself, even if it is in a shite sport, then good luck to him. Anyways was Kilkenny not let go?